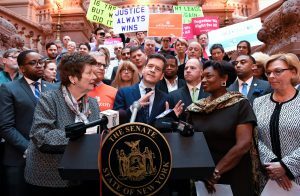 For more than a decade, victims of childhood sexual abuse in New York have asked lawmakers here for the chance to seek justice — only to be blocked by powerful interests including insurance companies, private schools and leaders from the Roman Catholic Church and Orthodox Jewish communities. Under the new law, prosecutors could bring criminal charges until a victim turned 28 [extending the period from age 23] and victims could sue until age 55. The bill would also create a one-year “look-back window,” during which old claims that had already passed the statute of limitations could be revived. Would you be able to leave everything you have ever known behind in order to follow your dreams? That was the choice Izzy Posen, a Hasidic ultra-Orthodox Jew faced when he decided to leave his isolated religious community. He told BBC World Service how his life has been transformed since breaking free. Video produced by Trystan Young and Alice Porter.